While on the Aquarium's 2011 Bahamas Collection Expedition during the first week of April, I had very limited access to the news of the outside world. So when I returned, I had a lot of catching up to do; one of the first things I did when I got internet access was get an update on the Tristan da Cunha oil spill. Since the MS Olivia ran aground on March 16 and then broke apart spilling its fuel oil two days later, four ships had traveled to the Tristan island group carrying supplies and staff to help with the clean up. The latest ship that arrive on April 13, the Ivan Papanin, also had a helicopter on board which will help transport staff and supplies to the remote islands. 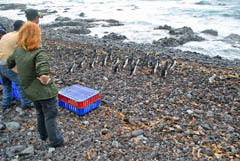 A 28 person team of international rescuers plus 70 to 80 local volunteers had set up a rehabilitation center on Tristan, with an ICU area, pens for oiled penguins waiting to be cleaned, a wash room and several rehabilitation pools, (they even converted the public swimming pool into a rehab pool for the penguins!). Northern rockhoppers being released in the converted public swimming pool. Over 3,700 oiled penguins have been transported to Tristan to begin the long rehabilitation and cleaning process. Before the penguins could be cleaned the staff need to make sure that the oiled penguins were strong enough to endure the stressful washing process. 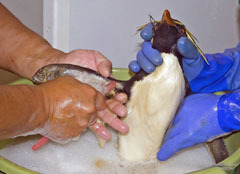 Then once they were clean the penguins were tested to make sure they were completely waterproof before release. As the Southern Hemisphere winter approaches the weather and the remoteness of the islands are still presenting difficulties to the cleanup effort, and many penguins have died before they could be rehabilitated. As of April 23, over 200 northern rockhoppers had been released. Another piece of good news is that surveys of Nightingale Island have shown that it is still rat free. Even though there are still hundreds of rockhoppers waiting to be cleaned, the team from SANCCOB left Tristan da Cunha, on April 23rd to return to South Africa. They left behind the knowledge and resources in the capable hands of the local environmental officials to help them finish the rescue effort. If you would like to help there is a fund set up to help with the cleanup effort. And to stay informed on the cleanup effort visit here and here.